Darius doesn't think he'll ever be enough, in America or in Iran. Hilarious and heartbreaking, this unforgettable debut introduces a brilliant new voice in contemporary YA. Winner of the William C. Morris Debut Award "Heartfelt, tender, and so utterly real. I'd live in this book forever if I could." --Becky Albertalli, award-winning author of Simon vs. the Homo Sapiens Agenda Darius Kellner speaks better Klingon than Farsi, and he knows more about Hobbit social cues than Persian ones. He's a Fractional Persian--half, his mom's side--and his first-ever trip to Iran is about to change his life. Darius has never really fit in at home, and he's sure things are going to be the same in Iran. His clinical depression doesn't exactly help matters, and trying to explain his medication to his grandparents only makes things harder. Then Darius meets Sohrab, the boy next door, and everything changes. Soon, they're spending their days together, playing soccer, eating faludeh, and talking for hours on a secret rooftop overlooking the city's skyline. Sohrab calls him Darioush--the original Persian version of his name--and Darius has never felt more like himself than he does now that he's Darioush to Sohrab. Adib Khorram's brilliant debut is for anyone who's ever felt not good enough--then met a friend who makes them feel so much better than okay. Indie Next Top Ten Pick "Layered with complexities of identity, body image and mental illness that are so rarely articulated in the voice of a teenage boy of color. Khorram writes tenderly and humorously about his protagonist's journey of self-acceptance, making it hard not to want to reach through the pages, squeeze his hand and reassure Darius that he is, in fact, going to be O.K." --The New York Times "Reminiscent of Simon vs. the Homo Sapiens Agenda (better known in movie form as Love, Simon) and Angie Thomas' phenomenal The Hate U Give, the novel chronicles a politically aware teendom where microaggressions are as much an everyday obstacle as untamed acne and humdrum mall jobs... Darius the Great Is Not Okay will have you craving a freshly steeped tea, an episode of Star Trek, and a glass of faludeh--all courtesy of one delightful package." --Entertainment Weekly "This is the hilarious and heartbreaking story of Darius: a clinically-depressed, half-Persian lonely American teenage Trekkie who heads to Iran for the first time to meet his mom's family." --Cosmopolitan "This is an incredible story of friendship, family, and identity that you absolutely won't regret reading." --Buzzfeed "Is your heart still full from reading Simon vs. the Homo Sapiens Agenda? Well, do we have the perfect book for you. 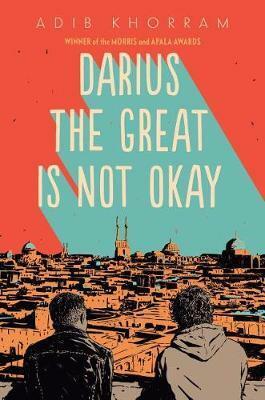 Adib Khorram's Darius the Great Is Not Okay is a tender look into the life of Darius Kellner, a nerdy half-Persian teenager who's having difficulty finding his place in the world." --PopSugar "Darius the Great Is Not Okay brings Iran alive, with sounds and smells and imagery, and you'll tearfully be rooting for Darius as he struggles with this mental health, identity, and his place in the world." --Bustle ★ "First-time author Khorram's coming-of-age novel brings to life the sight, sounds, smells, and tastes of [Iran] . . . as it shows how a boy who feels like an outcast at home finds himself and true friendship overseas." --Publishers Weekly, starred review ★ "Khorram's debut novel is filled with insight into the lives of teens, weaving together the reality of living with mental illness while also dealing with identity and immigration politics. This tear-jerker will leave readers wanting to follow the next chapter in Darius's life." --Kirkus, starred review ★ "Darius is a well-crafted, awkward but endearing character, and his cross-cultural story will inspire reflection about identity and belonging. A strong choice for YA shelves. Give this to fans of Adam Silvera and John Corey Whaley." --School Library Journal, starred review "A refreshing bildungsroman and an admirable debut novel that will leave readers wanting more." --Booklist "Khorram's debut novel is an affectionate portrait of Iran: the food and aromas, the rich traditions and eclectic culture. . . . Readers will understand that home can be more than the physical place you live, and that people who make you feel at home can come into your life unexpectedly." --Becky Albertalli, award-winning author of Simon vs. the Homo Sapiens Agenda "I love this story, and the way it combines the bitter of adolescence with the sweet of friendship and family. Brewed together they make a beautiful, memorable book." --Laurie Halse Anderson, award-winning author of Speak "Darius the Great is not just okay--he's wonderful. A story about learning who you are, who you want to be in the world, and how family will always be there, no matter how great the physical or emotional distance." --Sara Farizan, author of If You Could Be Mine "I've never read a book that so powerfully demonstrates how connecting with where you come from can illuminate who you are and help you figure out where you're going. From its deadpan Star Trek humor to its brilliant examination of mental health, Darius the Great is Not Okay is a supernova of heart and hope that's sure to become a classic." --Jasmine Warga, author of My Heart and Other Black Holes "Darius the Great is Not Okay is a total knockout. This story of identity and friendship--and how one can inform and reveal the other--will stay with me for a long time. And challenge me too, as a person and artist, which all great books should do. For its exploration of male friendship and cultural expectations alone, Adib Khorram's lovely debut should be required reading." --John Corey Whaley, award-winning author of Highly Illogical Behavior "Prepare to fall hard for Darius. His voice will grab you instantly, with sharp humor and tender growing up moments, and won't let go until the very last page. This is openhearted storytelling at its best."